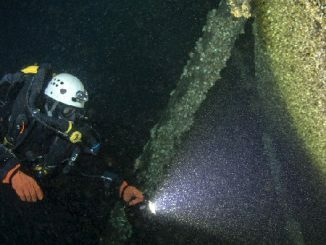 OSWEGO, NY – The newly created non-profit charitable organization, the Victor Orlando Woolson Foundation, Inc. (VOW Foundation), will hold its very first fundraiser. “We are starting out small and simple with a chicken barbeque at Lighthouse Lanes in Oswego,” said president Teresa Woolson. 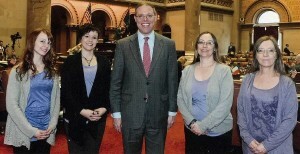 VOW board members in Albany from left are: Sarah Gauger and Angela Coville; Assemblyman Will Barclay; Teresa Woolson and Bonnie Caza. This first fundraiser will be a chicken dinner take-out event held at Lighthouse Lanes from noon – 5 p.m. Dinners will include half chicken, salt potatoes, baked beans and a roll – packaged for pickup. Free delivery will be available for three or more dinners purchased in the Oswego/Scriba area. Tickets are $10 and all proceeds will go to the VOW Foundation to be used for education and advocating about synthetic drugs. 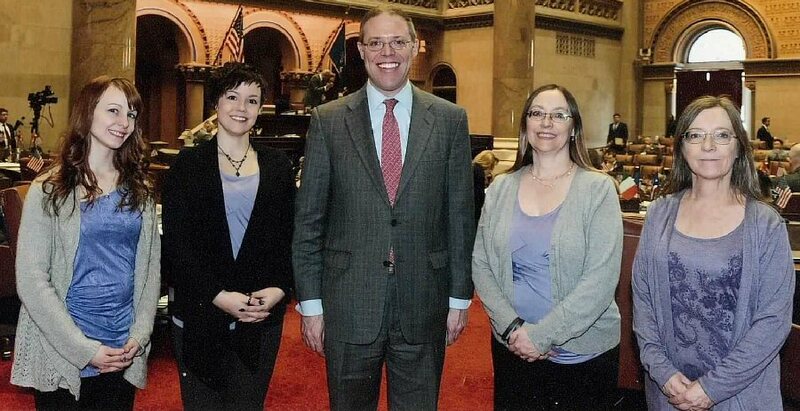 Four members of the VOW Foundation board of directors made a trip to Albany in March to advocate for the proposed legislation regarding synthetic drugs, A.6971/S.5401. Synthetic drugs continue to be a problem in Oswego County and more educational events are being planned for this year. For tickets please contact Woolson at 315-402-6119 or event chair, Karen Perwitz, at 315-256-3455.